Italy 2018 kits for Dream League Soccer 2018, and the package includes complete with home kits, away and third. All Goalkeeper kits are also included. This kits alos can use in First Touch Soccer 2015 (FTS15). The PUMA teams will now use the evoKNIT weaving technology that they put to the test with their African teams last year. The new shirt makes use of the classic blue of the Azzurri, which is accompanied by some touches of navy blue on the collar and cuffs + flag on the cuffs of the short sleeve version. 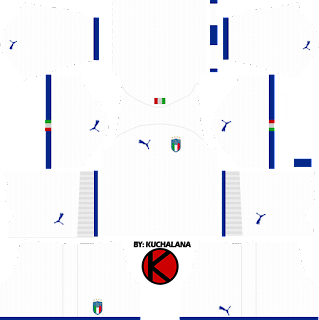 The Italian flag appears on the backs of the shirts. The uniform is completed with blue shorts and socks with navy blue applications. To support the launch of the shirt, the group of street artists Kamp Seedorf painted a giant mural in Turin with Buffon wearing blue. For the rest of the games, he will use his goalkeeper kit again, which in this case will be black with a dotted graphic on the front. This visit uniform has white as the main color following the trend of the feline brand with its national selections, using in this case blue for the neck and cuffs, in which the Italian flag is also present. 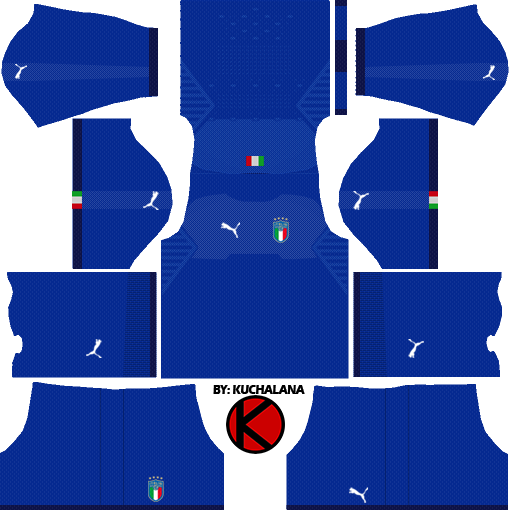 4 Komen untuk "Italy 2018 Kit - Dream League Soccer Kits"